1. 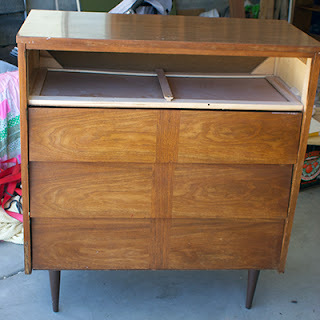 My husband and I have recently discovered mid-century furniture. The lines and style of it is so cool, unique, and most of it is built like a tank. 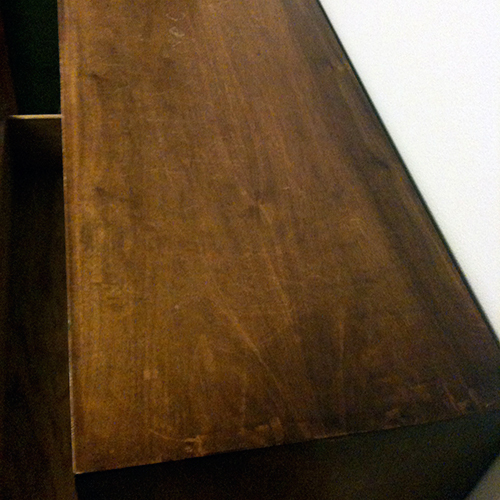 After you've gone through a couple Target/Ikea furniture items you start to appreciate when furniture is built to last. 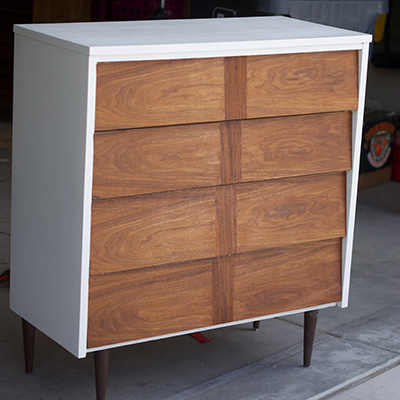 Since discovering mid-century furniture, we've been scouring Craigslist for cheap pieces to refinish. Well, ideally we are looking for pieces that don't need refinishing, but those in our price range tend to be fairly trashed. 2. Which brings us to this hutch. Ta da! 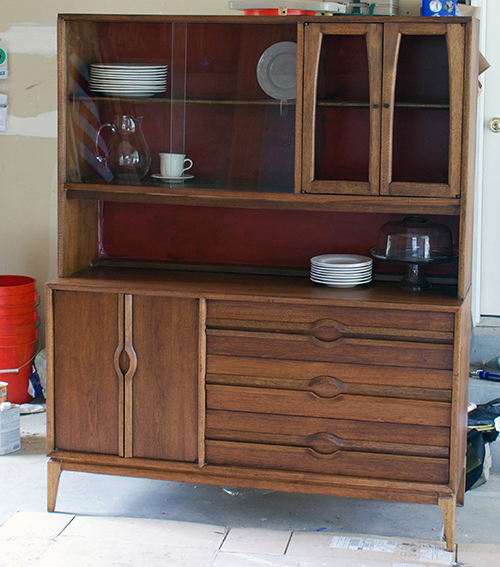 This is the hutch that I thought would almost kill me. Which took almost a month to finish. 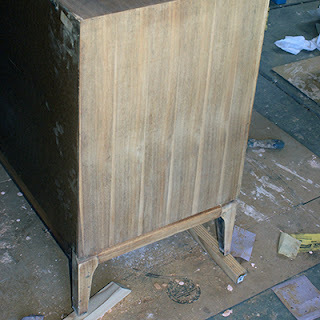 Here's a lesson folks - if you are going to start refinishing furniture, don't start out with a hutch. Or anything with multiple drawers, shelves, doors, wooden handles, etc. There's a learning curve, and you don't want to do everything twice on a hutch. Trust me. Mid-century Lane hutch. Yes, I staged it with dishes for a picture in my garage. That said, isn't the finished product pretty? And I say finished, even though I need to put glass in the doors and paint the red backboard. Just like everything with this project, you think you're done and then you find another thing that needs finishing. Sigh. Here are some before pictures. The previous owner(s) had scratched it, spilled black paint on it, and tried to restore it by painting some kind of dark gel stain all over it. Sloppily. We stripped it down to the wood and sanded it smooth, getting most of blemishes out in the process. 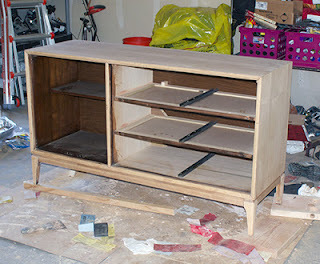 Then we stained it, put finish on it and put it all back together. 3. 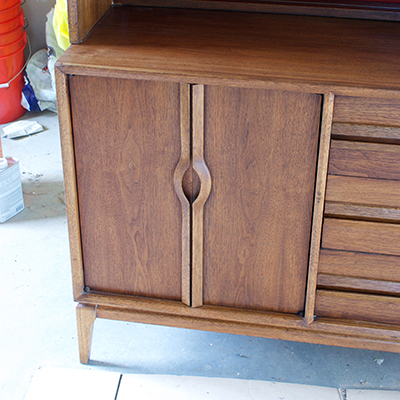 Refinishing furniture will get you hooked. 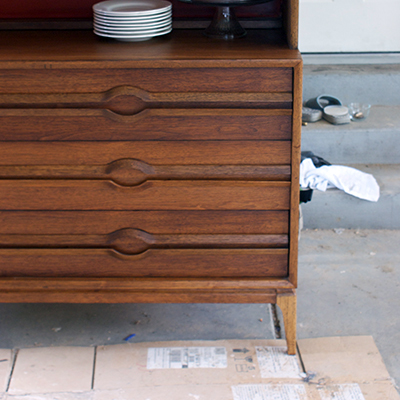 Despite all the work that the hutch was, my husband and I saw this dresser for a steal and had to get it. Sometimes you see the potential in things and can't help but "rescue" it. The man I bought it from pointed out the chipping veneer and said, "I filled it in with a marker! You can hardly see it anymore." Folks, you can definitely see it. It looks like . . . marker. Since the case was so trashed, we sanded it down and painted it. I'm normally a wood versus painting fan, but sometimes there is no other choice. 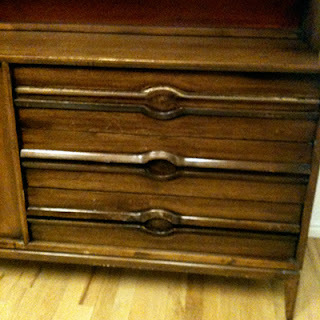 Plus, I like the way painting the case makes the drawers pop out. 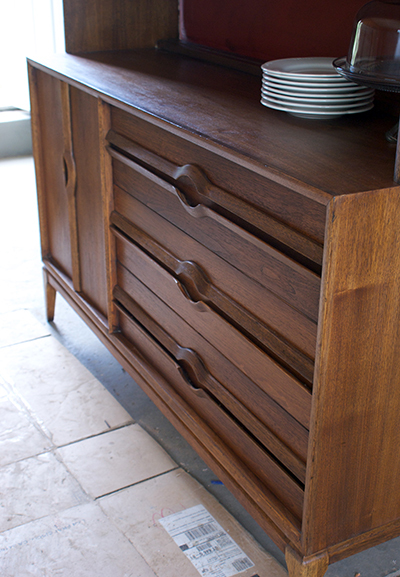 We stripped, sanded, stained and put new finish on the drawers. They are just gorgeous, aren't they? 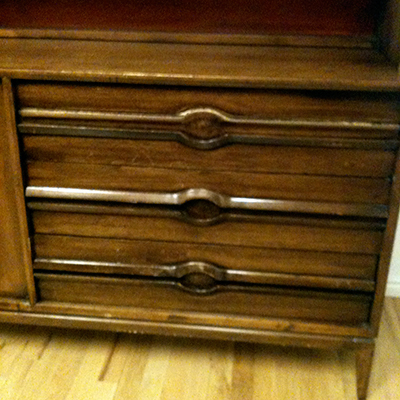 The dresser took about 1/8 the time of the hutch. 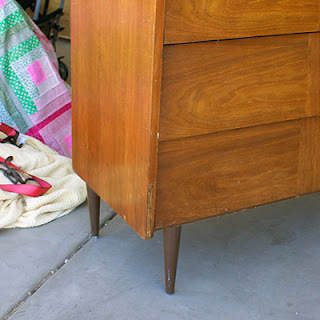 Which brings me back to point #2 - if you are going to start refinishing furniture, start easy. It's way more rewarding. 4. Yep, we're definitely addicted. I brought my husband's truck to work today to try to pick up some coffee tables on my way home. They were list for $1, folks. I'm crossing my fingers they are still there on my way home. Those pieces look fabulous! Good job on them.
" After you've gone through a couple Target/Ikea furniture items you start to appreciate when furniture is built to last." Couldn't have been said better. Particle board furniture works when you are in a pinch and need a unit for a dorm room or a small apartment, but it doesn't last. 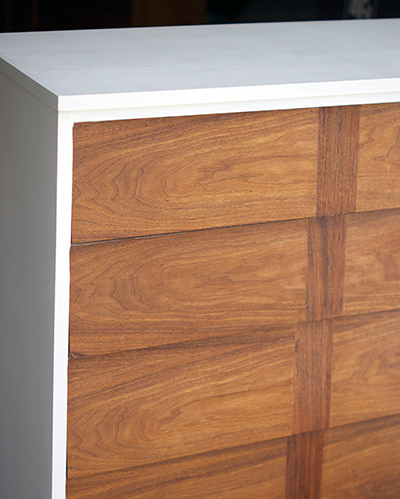 With real wood furniture, you are purchasing an investment. 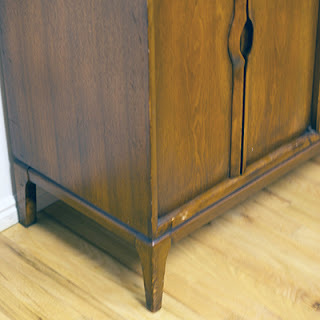 Plus as you have beautifully demonstrated, you can refinish and re-purpose wood furniture if you want to update its look, instead of going out and buying a brand new piece.